With all the wires going into the tool head, it sometimes feels like it is an unnecessary challenge to disassemble the whole thing when you want to rebuild a print head. 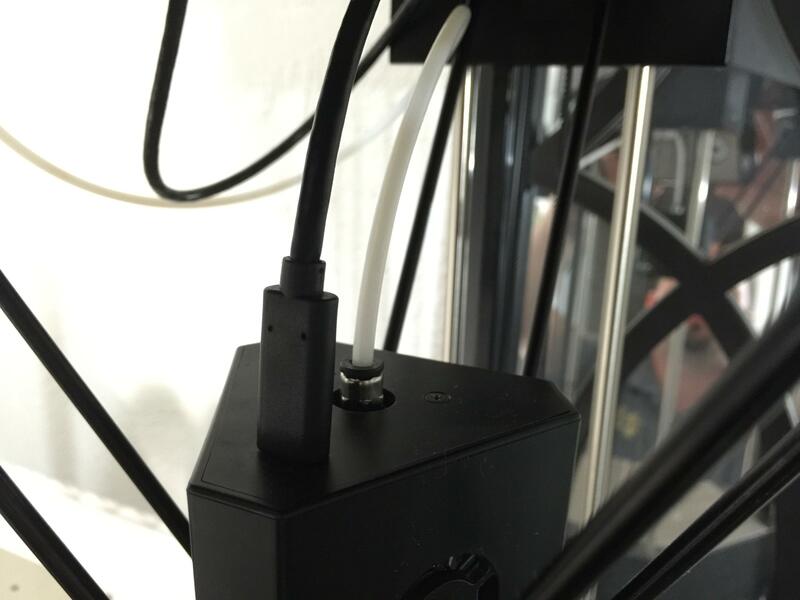 I began by looking for a simple connector that could handle all the wires going to the print head, giving me the ability to quick connect the unit when I wanted to work on it. I wasn't able to find anything inexpensive that could meet all my needs. I then realized that the USB Type-C connector can do all of this easily, and a USB Type-C cable would be a lightweight and flexible replacement for all the wires between the top of the unit and the tool head. The USB Type-C cable contains two Vbus wires and two ground wires that are capable of 2.5A each, which is two channels of 12V/30W power. This could be combined to deliver a single 12V/60W that is more than enough for a single 40W heater, or two channels at 30W each for a dual-heater setup. With E3D switching to 25W/30W heating elements, that would be good enough. The high speed capability of the USB Type-C cable comes from four shielded differential wire pairs, which I believe should be capable of handling at least 250mA each, more than enough for a heat sink fan, a layer fan, and a couple of thermistors. For additional fun, you could use the remaining wires for future expansion. 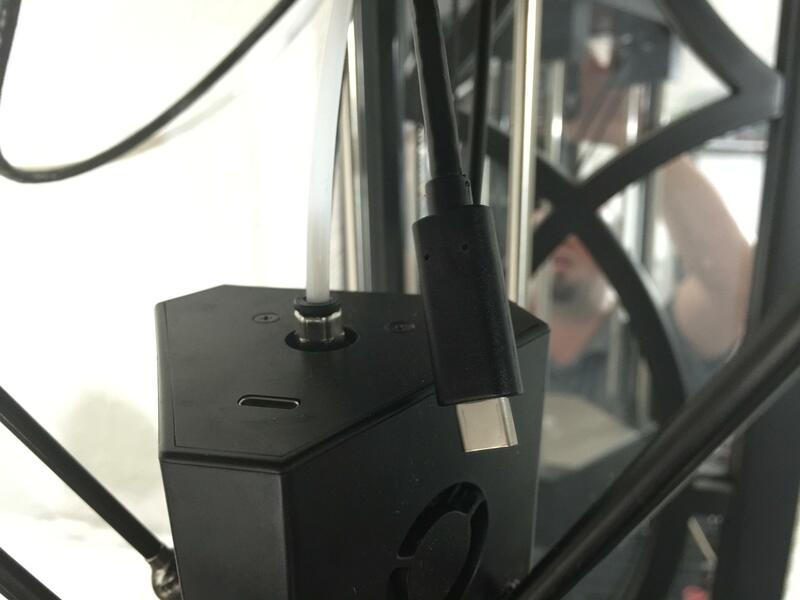 USB 2.0 is carried over the Type-C cable through UTP wires, and combined with the Vconn wire you could power a small USB device like a borecam to get an up close and personal view of your print head working. Here's my idea to develop a series of projects to work this idea out. The first stage is to use the wiring I listed above in a non-standard way to run power and other connections over the USB cable. A small circuit board on a simple effector plate would have a USB Type-C connector on the top, along with terminal connectors for fans, thermistors, and heating elements. Another small circuit board located in the top part of the Rostock Max would similarly allow funneling the current wiring into a USB Type-C connector. A simple USB Type-C to Type-C wire ($8 at amazon) would connect the two. This design would allow for mechanical testing of the concept in action. The second stage would be to begin adding real USB capability, perhaps testing out the idea of a USB 2.0 borecam. The third stage could be a migration of the toolhead control to actual USB, with the tool head being able to receive GCODE through a serial connection and manage the temperature PID loops itself. This could include thermocouple amplifier(s) built in to the tool head, reporting the data not through analog pins, but through GCODE responses back to the controller. Obviously, the third stage would require a special controller. I'd like to get some input from other people before I begin this project. Interesting concept. I like the idea of a simple clean plug in wiring to hot end. It has one 12 pin connector for everything. Pretty nice. Yeah, saw that one. It was an idea that I thought about for a bit, but I think that my idea is more expandable, and with less clutter. That said, there's nothing wrong with wanting an all-in-one connector. There are a staggering number of connectors on the market, it's just a matter of picking one with the right requirements. If you want to do it on the cheap, I'd suggest a visit to your local auto junkyard (the kind where they let you strip parts yourself). Every car will have dozens of potentially useful latching connector pairs in their wiring harnesses, and you can usually obtain plenty of cable on at least one side of it. Last edited by Eric on Fri Apr 22, 2016 9:45 pm, edited 1 time in total. I'd also comment that it sounds like this would produce a connector that is physically reversible but not functionally reversible. If so, this severely violates a central tenet of usability design. perhaps some of them might work? My FLUX Delta uses a USB C cable and connector for its print head. I have some concerns about its long term friction fit, but so far so good. Wow, I didn't know that it already existed... I'll have to check out this Flux Delta and learn more. Thanks! I looked at the Flux Delta and thought maybe they actually were following USB-C protocol, since the toolhead has it's own firmware and is somewhat intelligent. Which probably means one of their customers tried it and killed their device. Wonder how happy that customer is. interesting, Wonder why they didn't use a type-b style plug as it's less convenient to accidentally connecting something. I'm willing to bet that the reason why they used USB Type-C is because the new cable is capable of carrying 100W of power. That's the reason why I thought it would be the perfect method for connecting a tool head to the controller. USB of any sort (Except perhaps enclosed industrial USB, or USB over M8) is the wrong answer to connect a tool-head for one simple reason. It lacks a good physical retention mechanism. They all depend on little spring tabs, which will not survive large numbers of mate-demate cycles, nor will they survive catching a little. While having the cable snag on a joint and snap an arm is not good, having it detach or mis-align with every bump after a few dozen cycles is worse. We have USB connections on the Haas machines. They are used only to load programs. And yet, within a few months, the cable dies. Doesn't matter if it's an expensive 30$ OEM bulkhead cable, or a 5$ cable from office depot with a printed bulkhead. The spring clips wear down, the contacts lose their plating and their spring. Third problem: There's not a good way to deal with things in a reversible fashion. Anything you do, short of moving the switching MOSFETs to the effector and having a micro to control them will mean that it isn't reversible. And a physically, but not electrically reversible cable is a bad thing.